This fungal infection is caused by a normal fungus found on normal human skin; an overabundance of the fungus is what will cause the infection to develop. The infection appears as discolored, bleached, or splotchy patches of dry, scaly skin. Typically, tinea versicolor affects a person’s back, shoulders, and upper chest; that said, the infection may also develop on the neck, upper arms, or the face. Tinea versicolor is caused by an overabundance of Malassezia furfur, which is a normal yeast found naturally on everybody’s skin. In most cases, teens and young adults are much more likely to develop this infection. The infection can develop in people of any skin color. There has also been some research that shows a supposed genetic disposition to developing the infection, although there is not much information on this theory. Luckily, tinea versicolor is not contagious, as it is developed due to natural yeasts found on the skin. It also does not represent bad health in the patients who have been diagnosed with it. Luckily, there are no adverse symptoms of tinea versicolor other than the patches of discolored skin it develops on the affected areas. The discolored patches are caused by the acidic bleach, known as azelaic acid, found in the yeast that grows naturally on our skin. These patches may appear as red, white, pink, or brown and may be either lighter or darker than the rest of the person’s skin. These spots won’t tan or react to sunlight the same as the rest of the skin. These discolored spots or patches can develop anywhere on the body, although they typically develop most commonly on the neck, chest, back, and arms. In rare cases, they can present on the face. Some people may experience dryness, flakiness, or itchiness around the discolored patches, and pain is possible but not common. The spots often will subside during the winter and grow worse during warmer seasons. Thankfully, there are many ways to treat tinea versicolor; with that said, these treatments will often need to be used repeatedly, as the infection may return after treatment. Treatments will typically consist of creams, lotions, or shampoos put directly onto the affected areas of skin. Medication in the form of pills may also be prescribed, although topical treatments are much more popular. Overall, the treatment prescribed to a person will depend on the severity and specific circumstances of their infection, such as its size, thickness, and location. It is easy to find a tinea versicolor home treatment or over-the-counter (OTC), regardless of how severe or mild your case is. Over-the-counter treatments will typically include topical methods, which will often be in the form of creams, lotions, or soaps made from ingredients such as zinc, clotrimazole, miconazole, pyrithione, selenium sulfide, and terbinafine. These products are typically available anywhere although, in some cases, a prescription medication may be called for. Antifungal pills would be used to treat more severe cases and usage should always be monitored closely by a doctor, as antifungal medication may often have side effects. 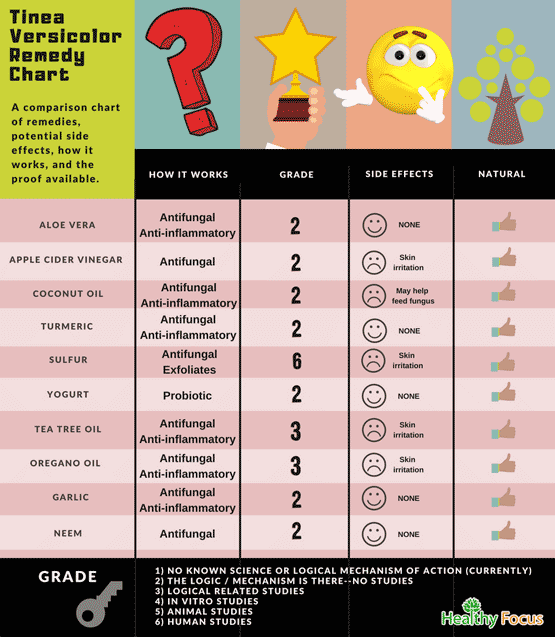 There are also many home remedies that are widely recommended, and many of these coincide with home remedies that are recommended for conditions such as eczema and acne. With that said, many home remedies that are recommended for these types of skin conditions could also be risky and cause further irritation to the skin, which won’t help the conditions at all. To keep things safe, you should always talk to your doctor before trying any home remedies for your tinea versicolor so you avoid potentially making things worse for yourself. Some home remedy options will have mild antifungal and antibiotic properties that can help combat the infection, but they may also produce more issues, especially with such sensitive skin. The ten most often recommended home remedies for tinea versicolor include tea tree oil, coconut oil, aloe vera, yogurt, oregano oil, garlic, apple cider vinegar, turmeric, Indian lilac, and simply a healthy diet. Other common home remedies may include baking soda and the use of essential oils. Aloe vera is well known for its abilities to treat a range of skin conditions. It contains excellent anti-inflammatory and anti-fungal properties which can help treat tinea versicolor. Aloe vera can halt the spread of the fungus responsible for the condition and can help soothe and heal damaged skin. Extract the gel from a fresh aloe vera leaf. Apply it directly to the affected area of your skin several times each day. Apple cider vinegar is another remedy that may help treat the condition. It has strong antimicrobial properties that may keep the growth of fungus in check and prevent any recurrence. Mix some ACV with an equal amount of water. Apply the mixture to the affected area with a cotton ball. Allow the vinegar to work on your skin for 15 minutes or so then rinse it off. Virgin coconut oil contains a range of unique properties making it an excellent remedy for a number of different skin complaints. It contains natural antifungals in the shape of medium-chain fatty acids which can help treat tinea versicolor. Apply your virgin coconut oil to the affected area of skin and let it dry in its own time. Alternatively, use your coconut oil as a carrier oil and mix in a few drops of tea tree oil then apply to the skin twice a day. Note : There are some concerns that coconut oil may act as a food source for the yeast and could potentially aggravate the condition. Turmeric is an effective natural remedy for many skin conditions because of its antimicrobial and anti-inflammatory prowess. Its antifungal properties can help treat tinea versicolor and prevent the infection from spreading. Mix a teaspoon of turmeric powder with a little water and mix it into a nice, smooth paste. Apply the finished paste to the affected parts of your skin and leave it dry for at least 30 minutes before rinsing it off. There is evidence that sulfur can help treat Tinea Versicolor. Many people have found that adding sulfur to the bath is very effective. It smells a bit but is not too bad if you add a few drops of essential oil and dilute it sufficiently. Good quality, plain yogurt is a wonderful natural treatment for Tinea Versicolor and similar fungal infections. It contains a range of probiotics which can help halt the spread of the fungus responsible for the condition. If you are going to apply yogurt topically, make sure that it is both plain and unsweetened, Leave the yogurt on your skin for 30 or so minutes then rinse it off in clean water. Consuming plenty of plain, organic yogurt is also a great way to fight the overgrowth of internal yeast and keep your intestinal microflora in balance. Tea tree essential oil is a wonderful home treatment for people with tinea versicolor. It has excellent antifungal properties that can prevent the infection from spreading, heal the disease and prevent its recurrence. It also has soothing, anti-inflammatory properties that can help relieve irritation. Add a few drops of tea tree essential oil to a tablespoon of virgin coconut oil. Apply it to your skin with a cotton ball. Once it has dried, rinse it off with warm water. Repeat the remedy twice a day for as long as you need. Studies show that oregano essential oil is among the most powerful of all antifungal essential oils. (3) Because of its antifungal prowess, oregano oil could help clear up your symptoms and prevent the infection from recurring in the future. Oregano essential oil is very powerful so it is important to dilute it well in a carrier oil before you apply it to your skin. Apply the diluted oil to the affected areas of skin with a cotton ball, let it work for 30 minutes or so and then rinse it off. Garlic is full of medicinal properties including powerful antifungal actions that which can help stem the spread of the fungus. It can also be applied topically to relieve inflammation and itching. You can either apply crushed garlic to the affected areas or apply a little garlic oil. Make sure that you wash it off thoroughly after some 20 to 30 minutes. Eating plenty of fresh garlic can also help protect against a recurrence of the condition..not to mention that it tastes great. With its excellent antifungal and antimicrobial properties, neem is yet another excellent remedy for tinea versicolor. Wash a handful of fresh neem leaves then boil them in two cups of water for around ten minutes. Strain the leaves out and allow the remaining water to cool. Use the neem water as a wash. Apply it to the affected parts of your skin several times a day. Products like tea tree oil, aloe vera, and garlic may each have their own benefits, especially for skin conditions like tinea versicolor, but they are all also potential skin allergens that could cause more adverse reactions when applied to your skin. Turmeric and apple cider vinegar can also irritate the skin if used too frequently. Even riskier, there are some home remedies that have the potential to actually increase the production of the infectious yeast, such as coconut oil, oregano oil and Indian lilac; this is especially true when the remedy ingredients are made with a base of olive oil. Yogurt seems to be the best option and is often recommended to be either ingested or applied topically for its probiotic benefits to be properly absorbed. When it comes down to it, you should always be careful when attempting to treat a skin condition yourself. Human skin is naturally very sensitive and this sensitivity will be amplified by the condition. While some home remedies may be helpful in some ways, they could also make things worse or just more uncomfortable. Although they likely aren’t necessarily harmful, you should still be careful and always speak with your doctor before attempting to treat tinea versicolor with a home remedy. 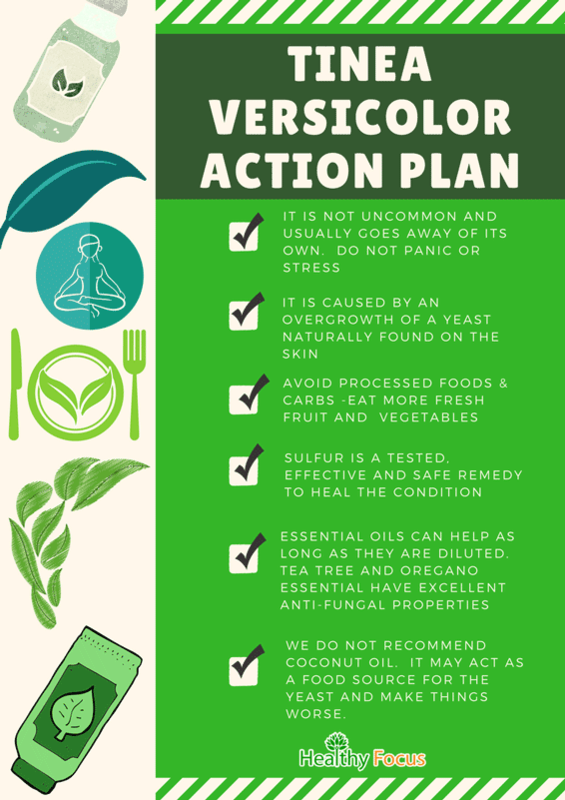 There are some home lifestyle changes you can make to help manage tinea versicolor, especially after taking a treatment prescribed to you by a certified doctor. To avoid having the infection develop again after treatment, adjust the way you handle your skin care. You should avoid skin products that use a lot of oils or encourage oily skin. You should also reduce the amount of sun exposure your skin gets and always use plenty of non-greasy sunscreen with a minimum sun protection factor (SPF) of at least 30 whenever you go outside. Using an antifungal shampoo frequently may help prepare your skin for sun exposure, although this isn’t recommended as a fail-safe option. Another helpful lifestyle change might also include wearing clothes that aren’t as tight and will allow your skin to breathe better. Breathable fabrics like cotton will help you keep from sweating, which will help prevent tinea versicolor from returning after treatment. You should also regularly shower and wash your clothes to keep any growing fungus away from your skin as much as possible. Exfoliating the previously affected areas may also help keep the fungus at bay. Because a weak immune system is also a potential factor in increasing the risk of tinea versicolor, a healthy diet may help prevent a return of the infection. By giving your body the proper nutrition that it needs, you can help boost your immune system to fight the fungus more efficiently and keep it from overgrowing on your skin. A healthy diet should include lots of vitamins A, B, C, and E, lots of fruits and vegetables, and foods with probiotics, like yogurt. Avoid eating too many carbs, as these may help increase the production of yeast. Of course, drinking plenty of water, as well, is the best way to boost your immune system. A doctor can diagnose a person with tinea versicolor through many methods. Most typically, a doctor will be able to simply look at a rash and be able to tell that it is tinea versicolor. However, he or she may also choose to use an ultraviolet light, which will shine a fluorescent yellow-green color over the areas with the tinea versicolor infection. Another method of diagnosis is through scraping some skin from the affected areas and looking at it underneath a microscope. No matter how your tinea versicolor is diagnosed, the next best course of action is to seek treatment right away to control the infection. While the fungal infection has no serious symptoms or side effects, it would still benefit you to seek treatment immediately. Immediate treatment could help relieve itchy or dry skin and can help get rid of the patchy, discolored skin caused by the infection. In the end, tinea versicolor is nothing to be afraid of. The infection is ultimately harmless and so are the different treatment methods available to help it; no matter what happens, you will be okay. The best thing to do is to speak with your doctor about your circumstances and how to treat and control the infection. You may be uncomfortable, but you won’t experience much worse than that. For the most part, tinea versicolor is quite harmless. Tinea versicolor is not uncommon and usually goes away of its own accord, It is not a serious condition so there is absolutely no need for you to panic. The condition is caused by an overgrowth of a type of yeast called Malassezia furfur which is naturally found on the skin. Studies show that sulfur is an effective and safe remedy to heal the condition and relieve the symptoms. Avoiding processed foods and carbs may help as could eating a nutritious diet full of fresh fruit and healthy vegetables. Essential oils can help as long as it is diluted properly. Tea tree and oregano essential oils have excellent antifungal properties and have proven successful remedies for many people. We do not recommend the use of coconut oil since it may act as a food source for the yeast and make the condition even worse.